Hi guys! It’s me, Venice. This blog post is for all the April Fools Day Lovers! I love April Fools, pranks, and how proud I feel when I pull a successful prank! My Grandma has this book called: The Practical Joker’s Handbook. I thought it might be fun to share some of the pranks from this book… And some of the pranks that we have used in our house! So, what are you waiting for? Read! Put a raw sausage between two of your fingers, so that it looks as if you have 5 fingers and 1 thumb on one hand. Now, choose a victim, and without them seeing the sausage, shake their hand, and say: “Ouch! My bad finger!”, giving them a nasty shock when you leave a sausage in their hand! Pretend that someone hidden behind a door, has got hold of your neck. (really, though, you have.) Roll up a sleeve from your shirt so that it looks different from your other arm. Grab yourself around your neck, loosely. Make fake choking sounds, and yell: “Ahhhh!” You can give someone quite a startle! Stuff your victims pajamas with newspaper, T-shirts, socks, etc. Tie the top piece of their pajamas to the bottom piece. Stuff two rubber gloves with tissues, and tie them to the arm holes (if they have short-sleeved pajamas, tie the gloves to a strong stick, and then wrap a white shirt around the stick, to look like pale skin, repeat on other arm). Blow up a balloon, and put a mask on it. Attach to the head hole. Prop up the dummy in the victim’s bed, so that it sits up, and you can still see the upper-half of the dummy’s body. Turn off the lights. Walk away. And wait for a scream. Stuff some confetti paper into an umbrella. Carefully close the umbrella, and put it back in it’s proper place. (Make sure there is no confetti on the floor, otherwise it will give your prank away). When someone opens up the umbrella, they will get a shower of paper! Note: This prank only works if it’s a rainy April Fools Day! Chisel a point on a bar of soap, and use that to draw a cracked look on a mirror. It can look quite real, so get ready for some fireworks! Press your thumb into an ink pad. Then, find a victim. Say to your victim that there is something on their face (but there is not). Use your inked thumb to swipe the thing off their face. But then say that it won’t come off, and do it again in a different place. (but not to far away from the first smudge, otherwise they will feel that you smudged on the other side of their face). Do it again, and again, and again, until you think their face is smudged enough. Say that it finally came off. Then, they will walk around with an inky face all day! Place the note on their pillow. When they go to bed, they won’t be able to get in the covers! Cut off one end (width-wise) off an old matchbox tray. Do the same on the lid. Line the matchbox bottom with white cotton wool. Splatter the wool with a little red ink or paint. Dust your finger with white flour, and at the base of your finger, use a paintbrush to paint on some more red ink or red paint. Place your finger on the matchbox tray. Slide the lid on. Tell someone that you found a finger in the basement-(if you don’t have a basement, say a closet), then take off the lid, and see their shocked face! Hand it to them folded up, so that it will take some time to open it. Once you give it to your victim walk casually, but faster than how you normally would, away! Sugar = Salt, Salt = Sugar. Put all the salt into your sugar container, and all the sugar into your salt container. Then, ask someone if they can make pancakes. Note: You may want a glass of water when you eat your breakfast! Bring a chair into the bathroom, and leave the door ajar. Fill up a PLASTIC cup half way with water. Stand on the chair and put the cup on the top of the door. Come back down, from the chair, and leave the chair where it is in the bathroom. Place the chair so that it is almost touching the door, but it’s not. When someone tries to open the door, they will get splashed with water! If you have a coffee machine, fill the compartment, where you pour water into, with vinegar. When someone drinks a coffee, they will never want one again! Fill the kettle with vinegar, instead of water. Then let it boil. Offer someone a cup of tea (in my house, there is never a “no” to tea!). Pour the ‘water’ into a cup with some tea. Let it steep, and give it to your victim. Teatime! Note: If you have a metal kettle, (like us) make iced tea instead. If you put the vinegar in your kettle, it will damage it. Trust me, we learnt the hard way. Make some oatmeal. Then add some food colouring. CAT/DOG PUKE: One drop of red, one drop of yellow. I hope you guys liked this blog post. And I hope you now know some good pranks to pull this year! It is feasible to eat exceptionally well on very little money. My definition of well is: healthy, gourmet food made with top quality, often organic ingredients that aren’t on the verge of expiration. The secret is to think outside the box. The advice is to build relationships in your food community. The hope is to pay the people who feed us a living wage (please don’t cheap out on them). The catch is that it is one helluva lot of work. But today’s dinner isn’t. It’s all about building skills. On Mondays, in our home, dinner is prepared by Lastborn. Tonight, she is making Oysters Rockefeller. Yes, she is five. Yes, I am serious. Yes, we are keeping within our $130/week budget. Yes, she loves oysters. 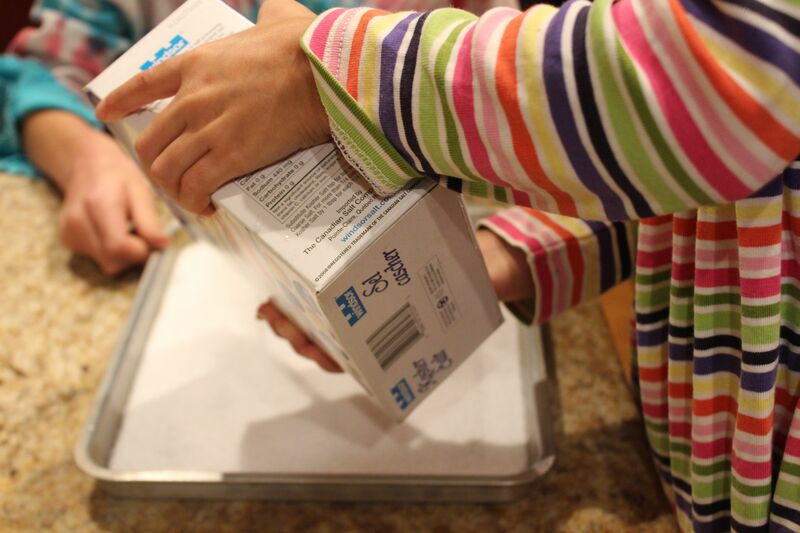 I try to create menu plans that allow the children to cook the foods that they particularly like. How can oysters be a budget food item? It’s all in the rationalization, my friend. If you think Onlyboy can justify dubious stuff until your head spins, let’s just say he learnt from the master (or mistress I guess would be more apt). In Canada, you can buy a box of oysters from the East Coast for $20 at Costco. There are a minimum of 18 oysters within. I think these are the freshest and best oysters you can buy in our landlocked part of the continent. Oysters are a low fat, health food item full of goodness. Oysters aren’t messed with in any way – just placed in a box and shipped. They’re an affordable seasonal luxury. 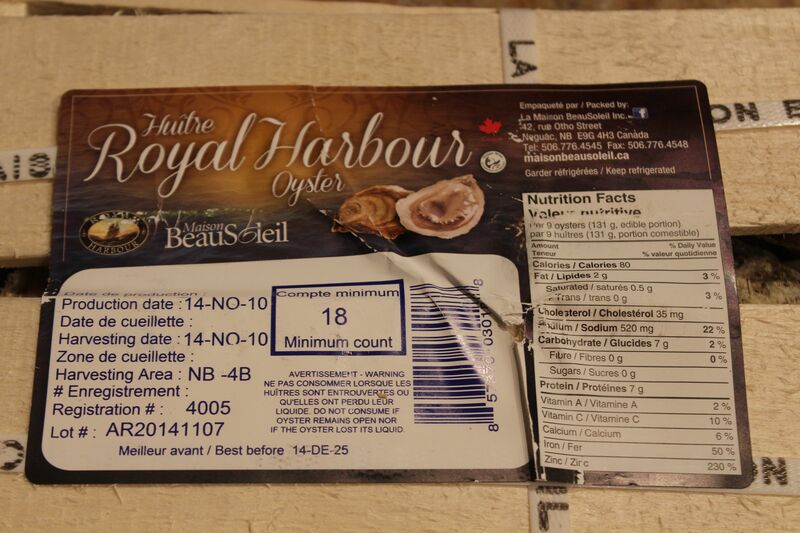 Oysters harvested on November 10 but best before Dec 25! And 9 oysters have 80 calories. 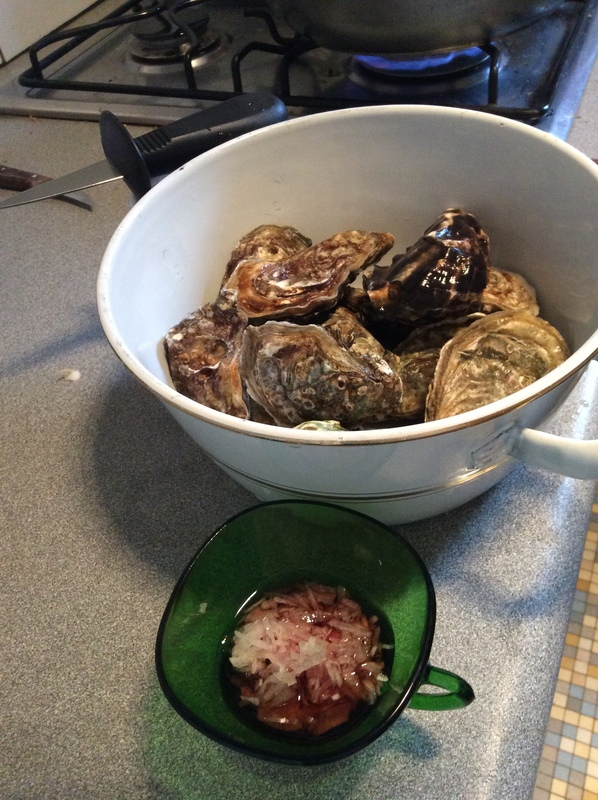 Huîtres = Oysters! (Apologies for re-using this photo, my bad). OYSTERS KEEP FOR WEEKS IN THE FRIDGE. That is the secret that makes oysters the perfect fast food. Each box has a best before date and you will see that it is far into the future. The thing about oysters is that you can just shuck them and eat them raw. How’s that for fast?! Eighteen oysters makes a satisfying meal for 3 people if you throw in a salad and some crackers and cheese. We often have a few oysters while we prepare dinner. People eat a couple of oysters and it keeps them going until the real food is on the table. We serve them with a mignonette sauce: 3 TBSP red wine vinegar, chopped dry shallot, lots of freshly ground black pepper, about 1 TBSP water. This sauce keeps well so have some ready in the refrigerator and your fast food will be even faster. Raw oysters with mignonette sauce, Paris. Another pre-loved photo (in fact I think I’ve used it twice already). Let’s face it, time is precious and if I had to constantly take new photos, I’d never get any blabbing done. I agree that $19 is a lot of spend on one thing especially when you have a total of $130/week. But at this time of year, we always have 1 box of oysters on our Costco list and we (mostly) come in on budget. I love good food and the only way our extreme budgeting is going to work for us is if we feel like we are still living a gourmet lifestyle. It’s a question of balancing the inexpensive food items with the pricier ones in a way that our pocketbook can stand. I am crazier than you thought, I don’t deny it, but with the right attitude and a supportive environment, your kids may well surprise you and try the oyster. We encourage our kids to try new foods and give them an honest description of how we think they will find it, if they need that. 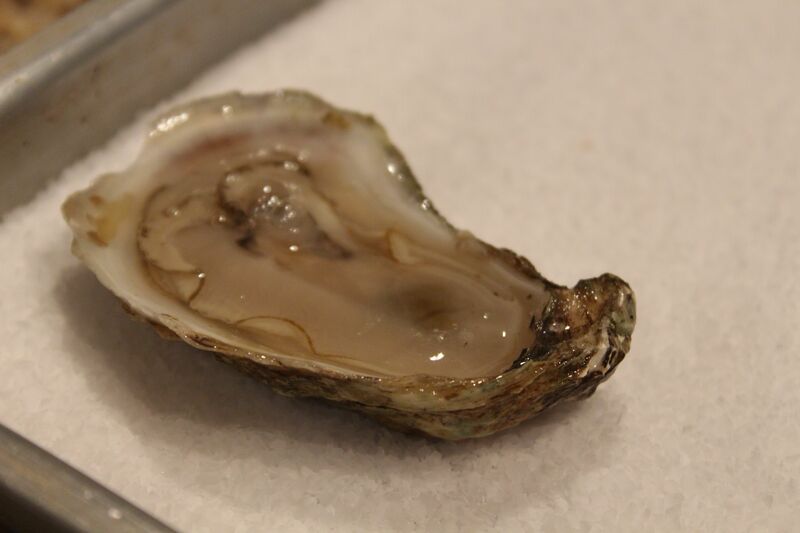 For example, with a raw oyster, you can’t just try a tiny, little piece of it. You have to commit to slurping the whole thing into your mouth. That is the biggest stumbling block for most people. The taste is sublime – fresh ocean, pure and simple. The texture is snot though so that is the other freaky bit. Oh, ya, and the oysters are alive when you shuck them. We are very up front on these points with our kids so that they can make informed decisions on what they want to eat. Our oysters are washed and ready for shucking. Two of our children love oysters and their enthusiasm has provided the peer pressure needed for the others to finally cave in and give it a go. Let’s just say that when we have our oyster apps, we see the same faces running to the counter and other faces regularly absent. Many who hate raw oysters will still adore them cooked. In Maine, they serve delicious fried oysters that Onlyboy scarfs every time we’re there. 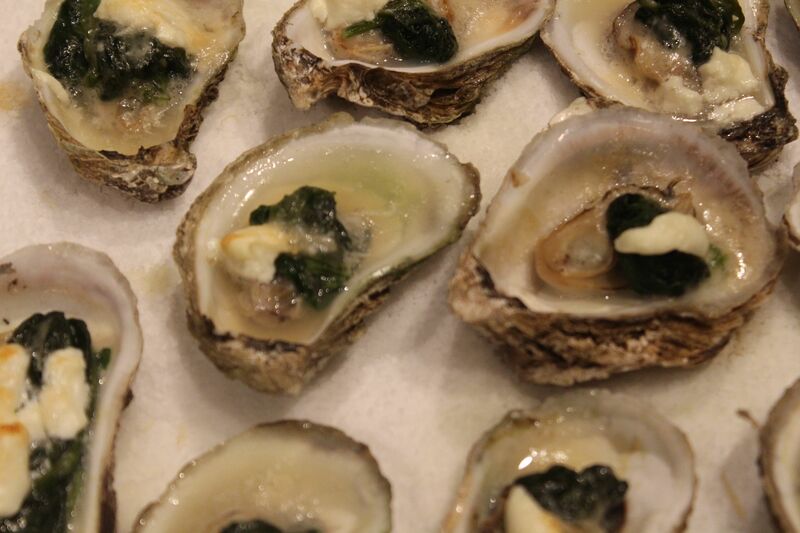 When we have more time and the ingredients, we make a variation on Oysters Rockefeller. Oysters Rockefeller are delicious and I have yet to meet someone who was scared to try one – the perfect gateway oyster recipe. The real recipe features a rich butter sauce of green vegetables and a topping of bread crumbs. This simple, gluten-free version is just as tasty as the original. Get a cookie sheet and spread a thick layer of cheap coarse salt all around. This is not the time to use your fleur de sel as the salt will be discarded. And speaking of salt, oysters are naturally salty from the ocean so please don’t ever add salt. When I make Oysters Rockefeller, I use the small tray that came with my toaster oven. That way, I can get away with using less salt and I can bake them in my toaster! 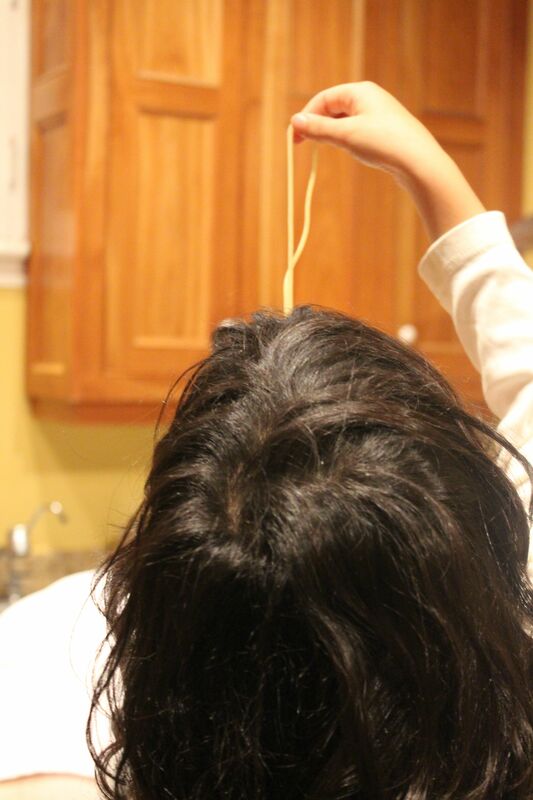 Five year olds love doing this. Shuck your oysters. Do not let your five year old do this part unless you want to be sharing your oysters with the triage nurses in the emergency room. Shucking oysters is something most people don’t know how to do and it is one big reason people don’t buy oysters in the shell. You do need an oyster knife which will probably cost about $6. Rinse your oysters to get off any dirt and grit. Place an oyster on a bunched up tea towel and hold firmly with your left hand if you are right handed. You want the flat side of the oyster on the TOP, not sitting on the counter. The tea towel will help you to keep the oyster from tipping over. 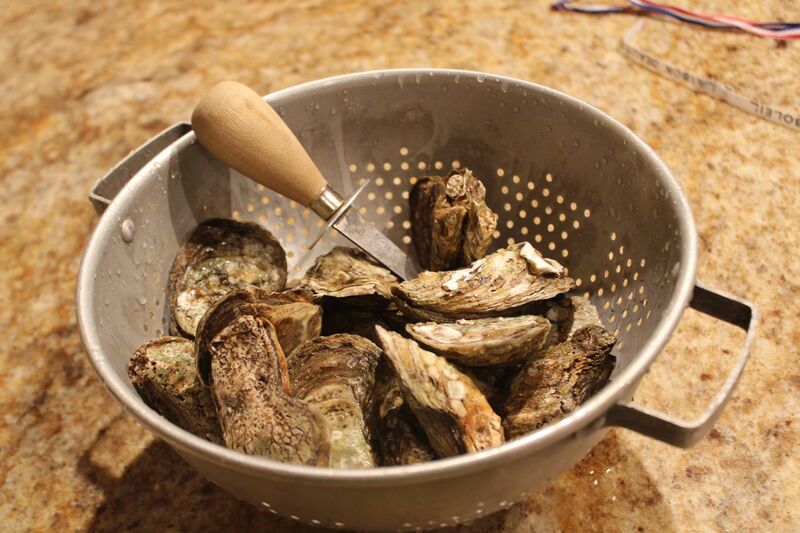 The oyster should be held close to your body on a waist high surface – a kitchen counter is perfect. Place the tip of the oyster knife at the hinge. Brace yourself (tense all your muscles) and try to jam the knife into the hinge. I am just an amateur homeschooling oyster shucker so I offer you the amateur method that works every time: firmly but gently keep wiggling that knife back and forth until the oyster finally gives up. With some oysters, you will get to a point where you are willing to let the oyster win. NO! You have paid for that oyster and you will eat it. Besides, think of how rank it will smell if you toss it. The oyster deserves a better send off than ending up as compost. He deserves to become a Rockefeller! Insert the oyster knife in the hinge and wiggle. When opening the oyster, take care not to spill all the lovely juice. When the hinge has loosened, resist the temptation to look inside. The top shell is still fastened by a “foot”. 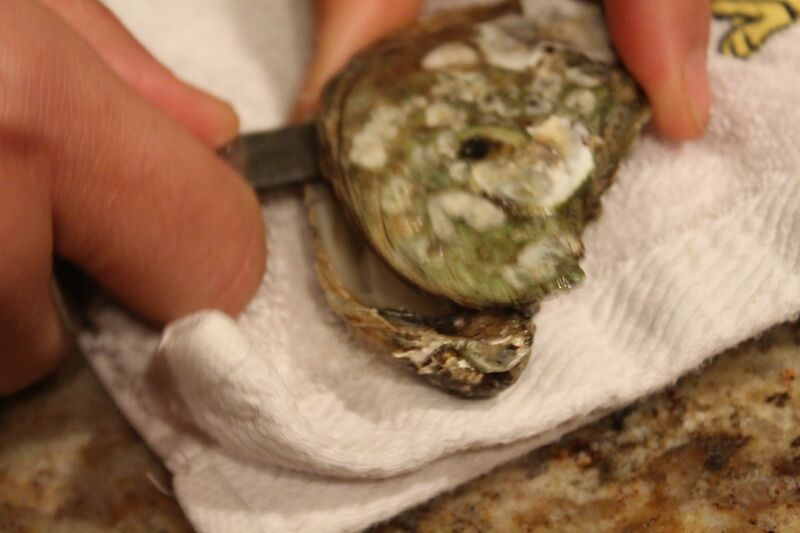 Slide your oyster knife along the inside top shell to cut the shell free. Now remove the top shell and pick out any little bits of broken shell. 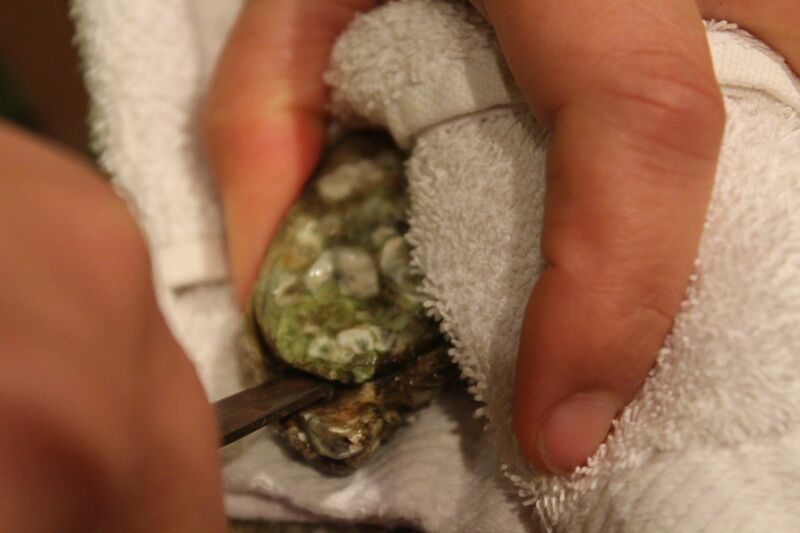 Run your oyster knife under the oyster to free it from the bottom shell. Sit the oyster in its bottom shell in the salt. The salt acts as the tea towel to keep the concave shell from tipping. Feel free to eat a couple raw (after all, you are making dinner ;-). 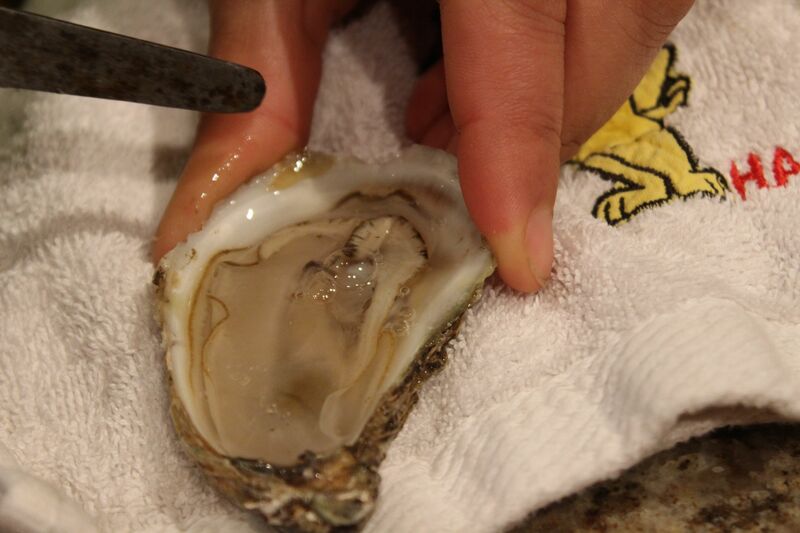 Slide the oyster knife under the top shell to cut through the foot. Pick out any bits of broken shell. Perfect oyster on a bed of rock salt. Once the tray is full, let your five year old loose. 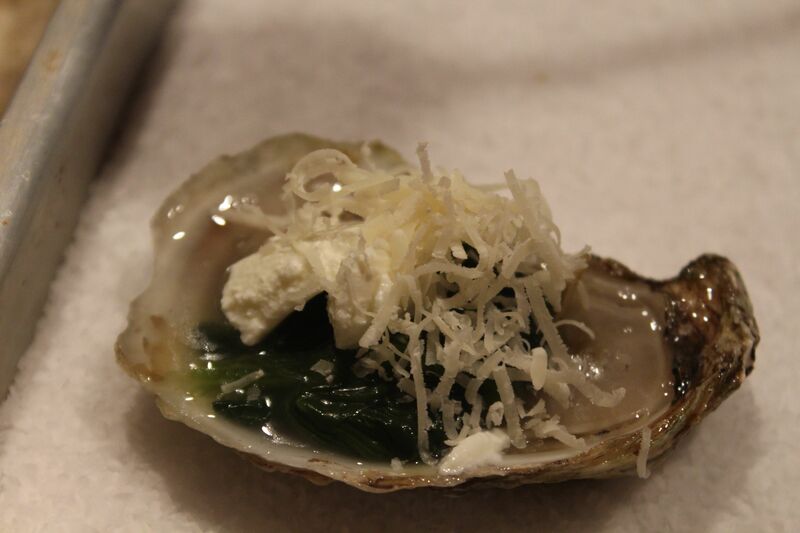 She will top each oyster with a bit of cooked spinach, some finely chopped cooked bacon or sausage (optional IMO), a dollop of sour cream and a grating of Parmesan cheese. Pop in the oven and bake for 8-10 minutes at 425 degrees. Enjoy! Spinach, sour cream, Parmesan. Good to go! Fresh out of the oven. Beauty! Will this be enough to feed a big family? No. That is why you defrosted some black bean chili for the next course. By this point, your five year old will have satisfied her cooking mania and won’t resent the chili. After all, parents will be scrounging around trying to find another Rockefeller or two and that will make Lastborn glow with pride. If you’re a kinda old Canadian you will remember our famous president. I see citizens of other countries reading this in consternation. Canada? A president? I thought they had a prime minister? Our president in 1977, popular but not yet almighty. The prime minister is in charge of the government, it’s true, but once we had a president in charge of the way we lived. 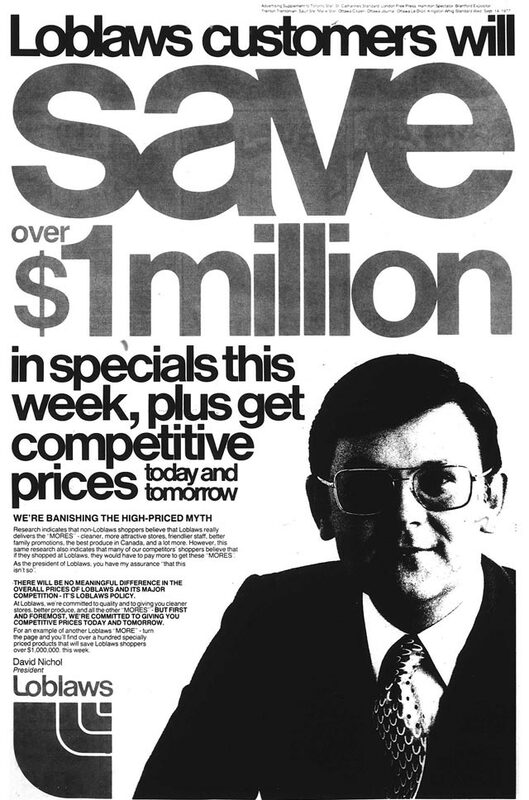 His name was Dave Nichol and he was the president of the grocery chain, Loblaws. He came to power in the 1980s as a marketing genius whose fame grew and grew. I guess he ran out of regular groceries to sell so he had to start travelling the world looking for unusual stuff that most Canadians had never heard of, much less tasted (like Passion Fruit Sorbet – 1983). Like Szechuan Spicy Peanut Satay. Then he would tinker with the recipe until it was a gloopy, sweet, not spicy former shadow of itself and bingo “Memories of Szechuan Sauce” would be born. There were zillions of Memories Of products in the 80s and 90s and everyone was talking about them. I kid you not. But this post is not about memories of delicious exotic fare turned into preservative laden crap, it is about the real memories that come out of family (budget) travel. It was the best of times. It was the worst of times. 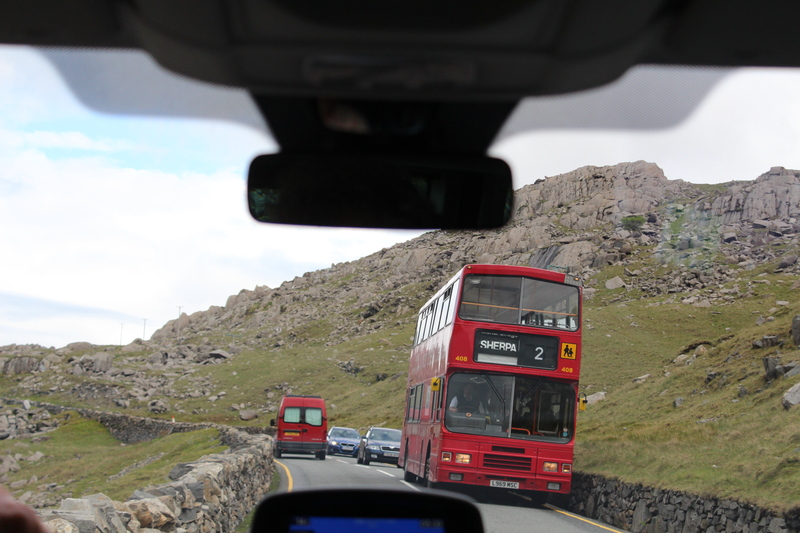 It was Wales for our teens. Which makes what happened on December 5, 2014 all the more significant. On that fateful day, the kids and I sat down as usual to have elevenses (tea and cookies at 11 am). Normally, this is the time I read a history book and novel aloud. Today though, we got to talking about our big trip. The kids rehashed all the crazy things we did and argued about where what took place. A hop, skip and a jump from the pub with bad wifi (password real ales)! After reviewing our adventures through rose-coloured glasses, Firstborn declared that we should go on another backpacking trip (!). Onlyboy and Paris were aghast and chimed in, “Eight months is WAY too long.” Okay – here comes the punchline. Firstborn says, “Well, we wouldn’t want to only go for 6 weeks because that wouldn’t be worth it!” She said that. I pinky-swear. After debate back and forth, the kids decided that four months would be the perfect amount of time for such a trip and that they would be ready to leave as soon as Early Spring 2015. I would like to point out that we have been home now for less than two months. This may not seem that amazing to you but it was one of the best gifts I have ever received. To hear that all my children from the five year old to the seventeen year old would willingly hit the road with us again was like manna from heaven. When you have a larger family, there comes a point when you realize that although you have very young children, the time remaining for family adventures and holidays is drawing to a close because you also have older children. This is a bittersweet time for the larger family. Everyone in the family is proud of the older children and excited at their upcoming romances and adventures. But they know there will be a huge hole in the family when they leave. When my older children leave home, we will be bereft, parents as well as siblings. Our kids don’t remember this (2005). Tant pis! 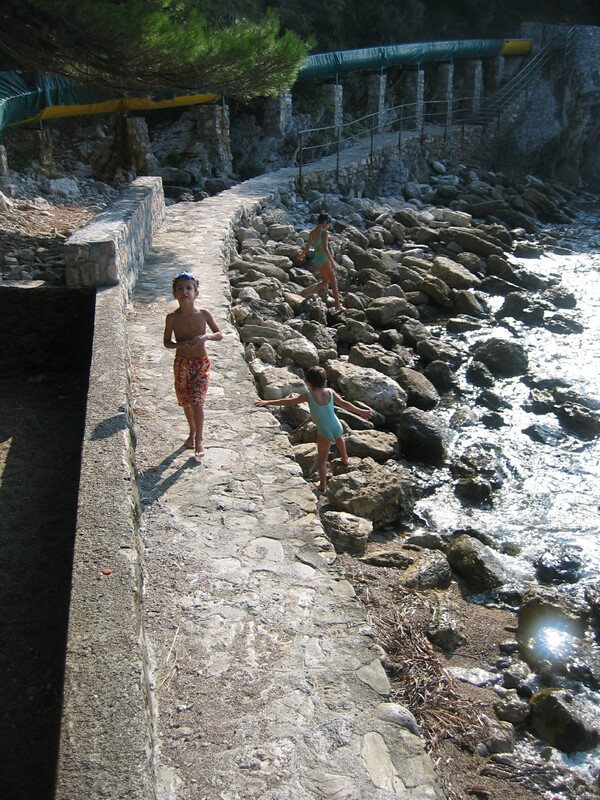 For long time followers, this is the really dumb Montenegrin waterside I’ve blogged about in the past, here in off season. I am the last person to recommend going into debt to finance a holiday. I believe we live in a culture where instant gratification is the norm and where people are living beyond their means. I would say though, that your window for family holidays is probably a lot smaller than you think. 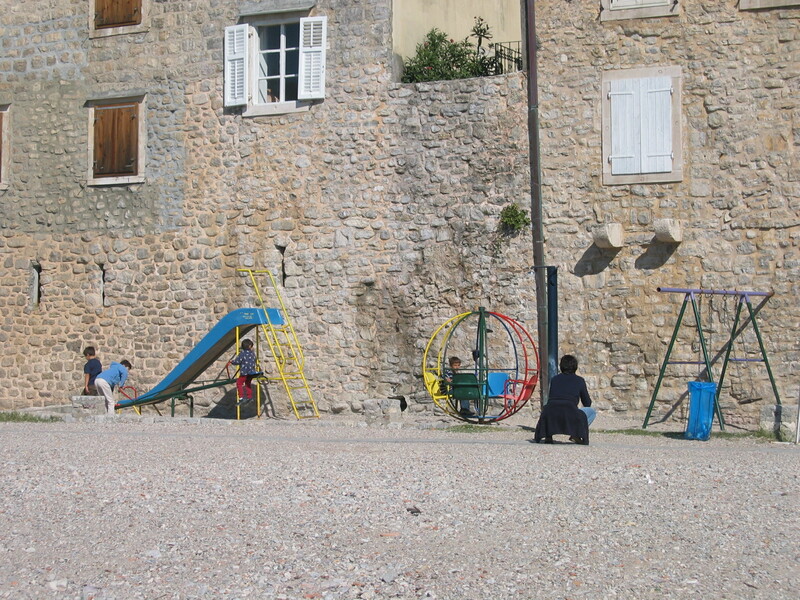 Most people want to wait until their children are older, both for ease of travel and so that the children remember the trip. If you factor in that your children might have jobs or competitive hobbies or sweethearts or grumpy dispositions when they are teens, you might only have three or four years. If an international family holiday is a dream of yours, remember that your biological clock is ticking. 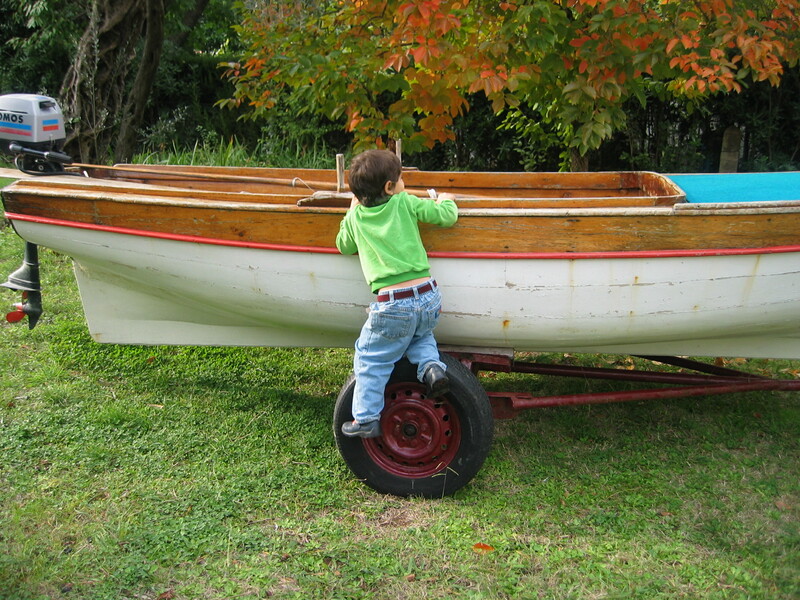 Paris doesn’t remember having short hair (after a traumatic lice episode) or living in the Balkans with a boat in her garden (2006). No problem! We’re definitely NOT most people so we have been travelling far and wide since Firstborn was 8 weeks old. When we only had little kids and people would comment on how the tots wouldn’t remember the trip, Fahbio and I would retort, “We’re not travelling for them, we’re travelling for us and we can’t leave them home alone.” Badass to the core, I know but you get the point. It’s true that they don’t remember those trips but the journeys are woven into our family history. They have heard their parents reminisce, they see the photos displayed around our home, they’ve sometimes returned to the same place years later, they’ve often met the people we encountered. 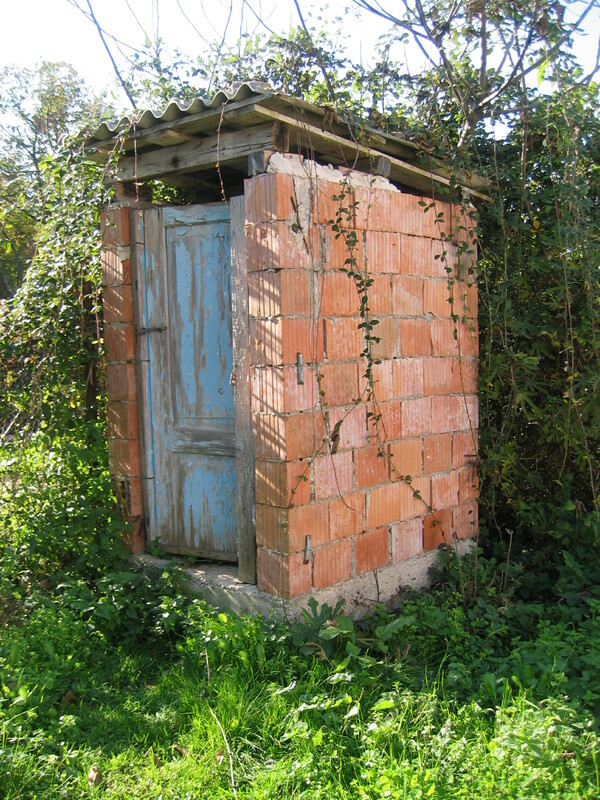 Thankfully, only SWMBO remembers eating ćevapčići at a restaurant where the waiter jerked his thumb to this sad specimen out back when a young daughter needed the loo! Sudden loss of appetite, fer sher. Most importantly, those early trips with young children allowed their parents to be the people they wanted to be and that made them better parents. And believe me, they needed all the help they could get in that area ;-) Fahbio and I have always lived to travel. If we had decided to put that aside until our children were 10 years old, we would have stifled an integral part of ourselves. Not everyone feels this way about travel, but for us, it be so. Today’s Quote of the Day comes from The Tale of a Town, a Community Theatre project. A small team is travelling across the country gathering stories which they then transform into a multi-media theatre piece about a particular neighbourhood. Pretty cool stuff. 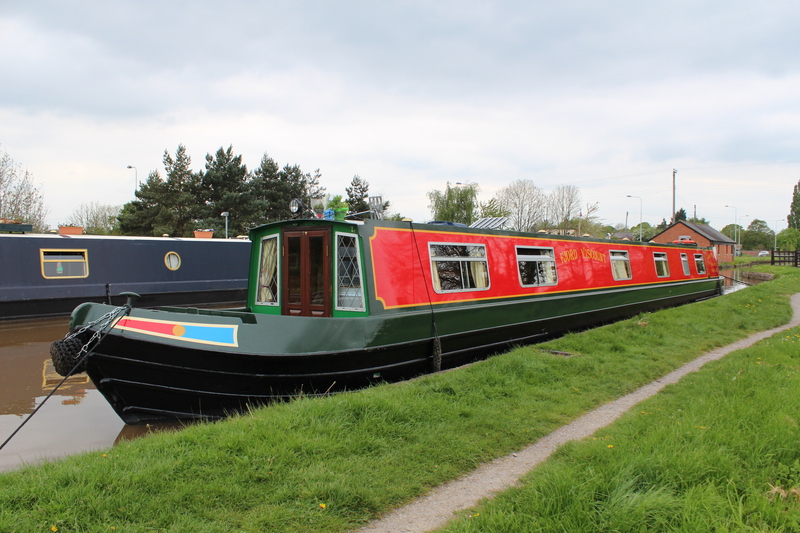 To get local people thinking and talking, they prompt them with a few questions. 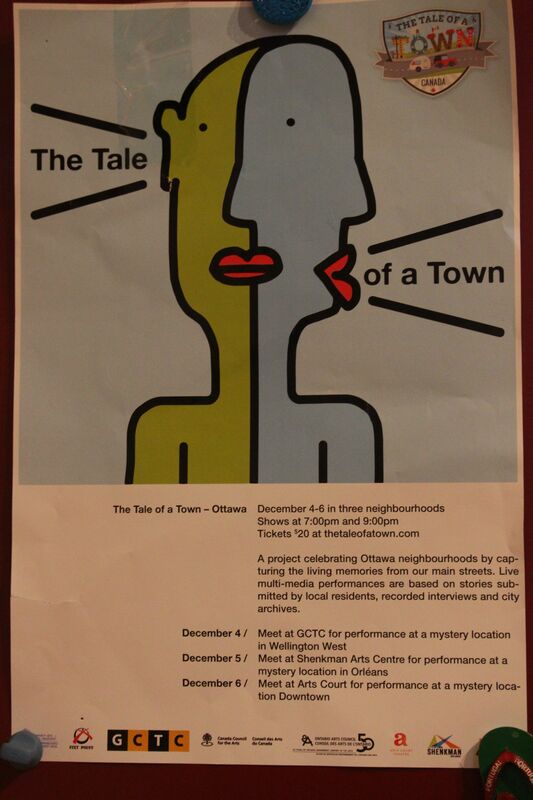 In Ottawa, people gave their stories in either English or French and then a wonderful bilingual play was put on in early December based on the community input. Tale of a Town: What is no longer in your neighbourhood that you miss? My friend, if that doesn’t bring tears to your eyes, nothing could. Silly SWMBO – you forgot to post this even though you wrote it days ago! Dahling, the marathon blogging session is coming to an end. I promised to document our shopping and eating for a week and I’ve done so. 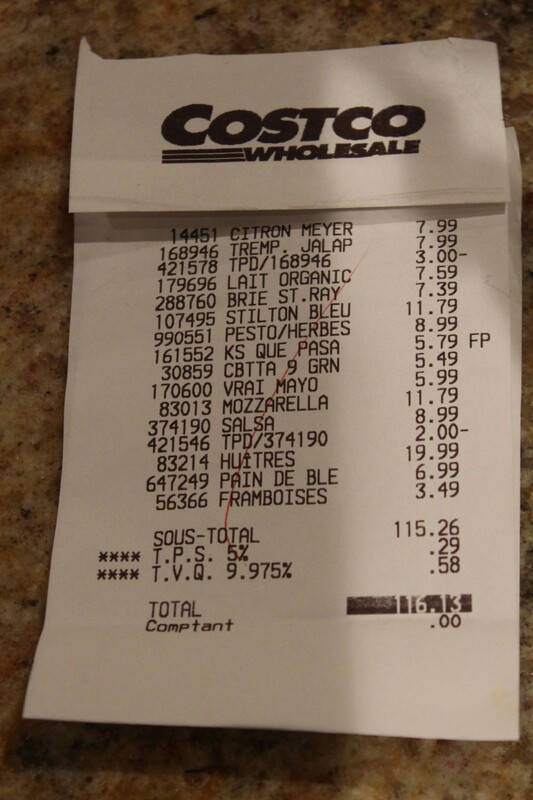 I am happy to continue providing our weekly shopping receipts and dinner menus if that is helpful. You lot are so quiet, I will probably just have to decide telepathically what you would like best. A good month into our severe grocery budgeting and I am finding it easier everyday. We now finish the week with extra food. Not only that, but we have made extra quantities of some items and frozen them for quick future meals. This week, we also had $15 leftover. Remarkable! 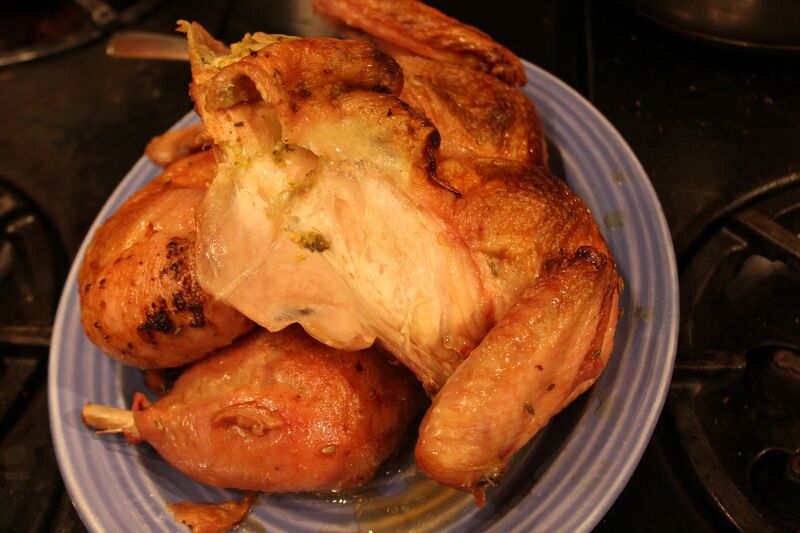 A big pan of roasted sparrows? Nope. 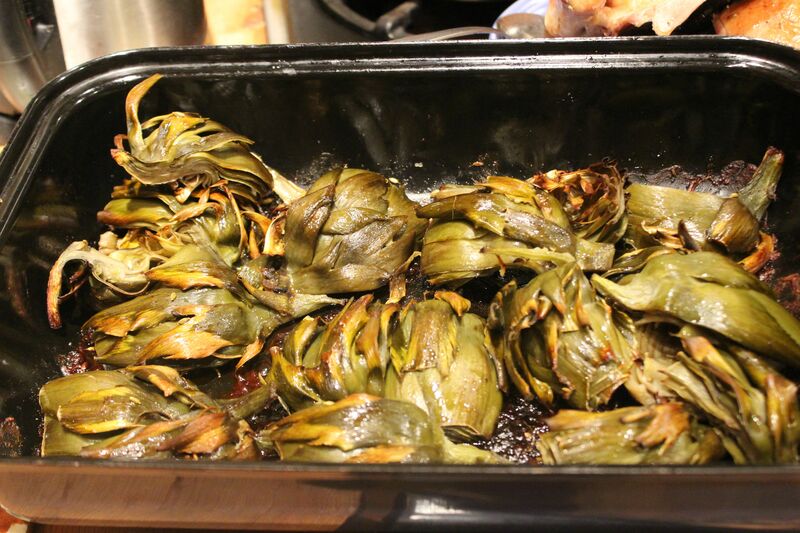 These be artichokes. Lunch – Quick grab of whatever before heading out for a hilarious live theatre performance with the family (pay what you can). Garlic pasta for the hollow legs. Snack – Extruded, processed veggie straws with spicy yogurt dip. Oddly delicious. 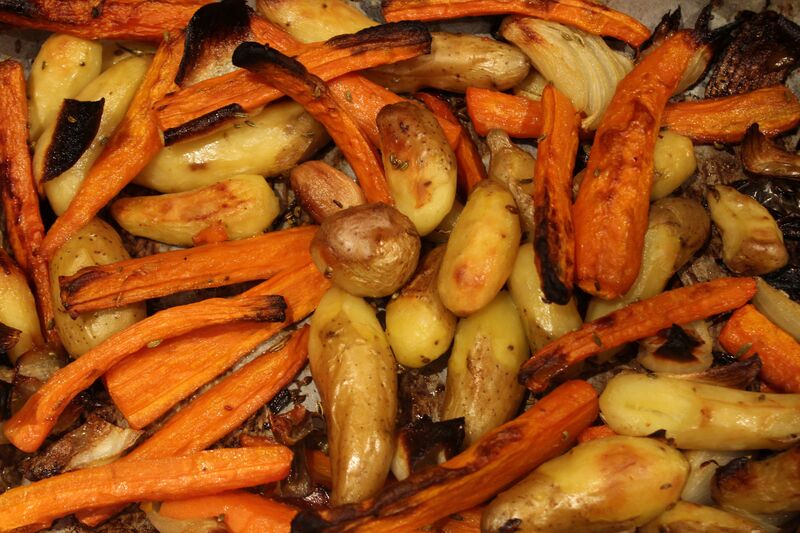 Dinner – Roast spatchcock chicken with roasted carrots, artichokes, onions and fingerling potatoes. 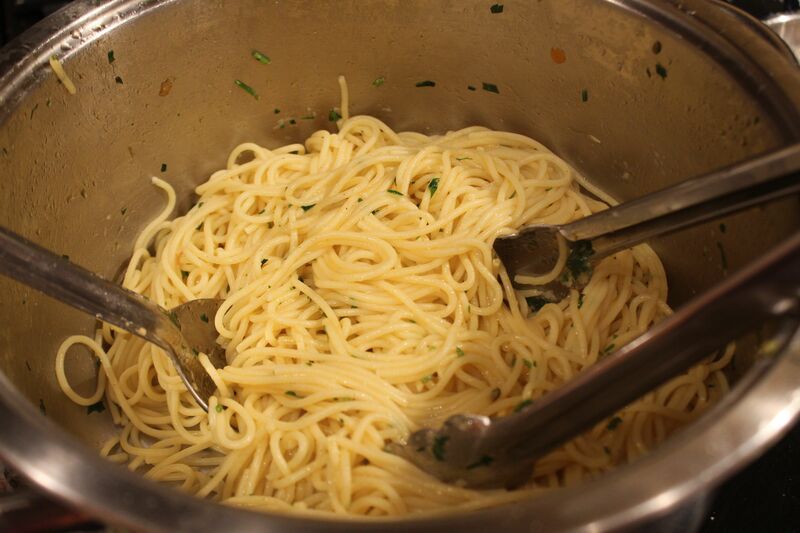 Garlic spaghetti for the anti-potato brigade.